From Portland Monthly Magazine. 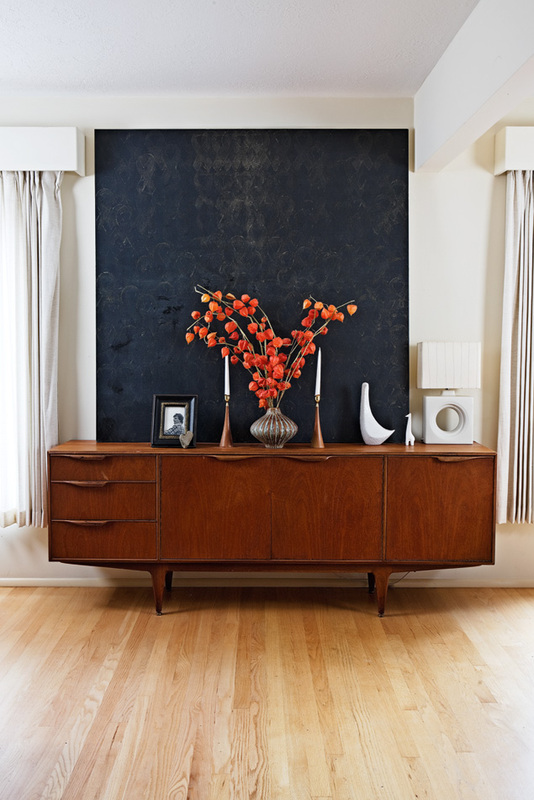 A monochromatic painting resting on a teak credenza becomes a sort of contemplative feature wall. Why is this picture so compelling to me? It’s not as if it’s that different from the thousand other midcentury modern still lifes I’ve seen in the past few years, but sometimes one variation on a theme stands out from the others. This entry was posted on Friday, April 3rd, 2009 at 6:44 pm	and is filed under design. You can follow any responses to this entry through the RSS 2.0 feed. You can leave a response, or trackback from your own site. Bizarrely, I have that exact same credenza in my living room… but it’s about twice the width. I guess they must have made a compact model!